We’re back to regular roster rules in the NHL, and with that teams will be making several moves to address their needs. A pair of teams, Boston and Dallas, used the holiday freeze to go over the 23 man roster limit and will need to come back down, while others were just waiting to send some underperforming forwards down to the minor leagues. As always, we’ll keep track of all the movement around the league right here. Rourke Chartier is on his way back up to the San Jose Sharks, recalled by the team after their win over Anaheim last night. Chartier has played 13 games for the Sharks this season, but is looking to make a bit more of an offensive impact if he gets back into the lineup. The 22-year old has just a single point—his first NHL goal—in those 13 contests. 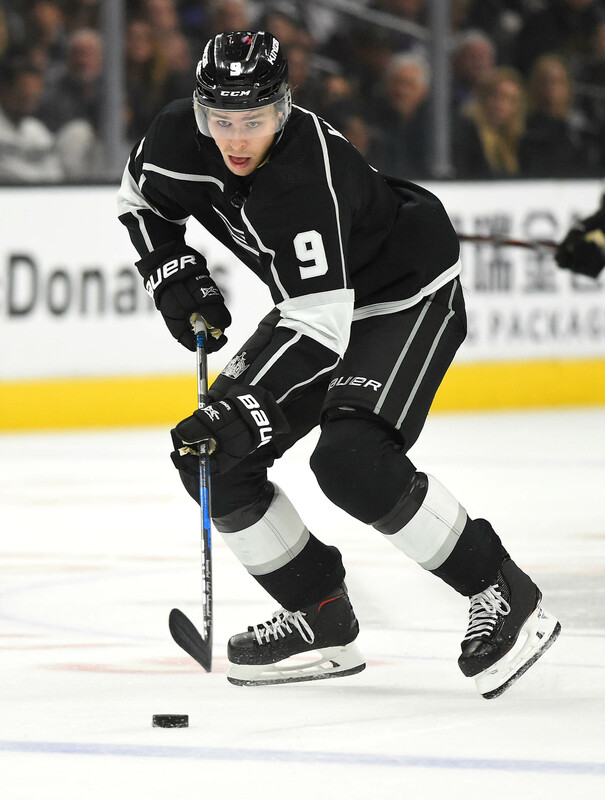 Though the Los Angeles Kings have normally been moving trios of players up and down to save cap space, that may not be the plan with Daniel Brickley who today was assigned to the AHL by himself. Dion Phaneuf resumed skating yesterday, meaning Brickley’s opportunity at the NHL level could be over for the time being. John Stevens has been on season-opening injured reserve for the first part of the year, but today was assigned to the Bridgeport Sound Tigers. That likely means that Stevens is ready to resume his playing career, one that will likely keep him in the New York Islanders minor league system for the rest of the season. The St. Louis Blues have assigned Zach Sanford to the AHL, giving them room on the roster to activate Robby Fabbri from injured reserve. Sanford has already set a career high with nine points in 23 games this season, but will have to continue to hone his skills at the minor league level for now. The 6’4″ forward hasn’t quite established himself as a full-time NHL player, but there is certainly still potential to grow into a reliable middle-six winger. Chad Ruhwedel has been sent to the AHL on a conditioning stint, but he’ll remain on the Pittsburgh Penguins 23-man roster. The 28-year old defenseman has played in just 11 games this season, and with Jamie Oleksiak returning to practice in full there wasn’t room to get him into the lineup. Lias Andersson hasn’t adapted to life in the NHL quite as well as some had hoped, and today the New York Rangers sent the top prospect back to the AHL. The 20-year old center has just four points in 21 games this season, but is such a huge part of the Rangers future they must put him in the best situation to succeed. Andersson did have 12 points in 14 games with the Hartford Wolf Pack earlier this year, a pace he’ll hopefully return to now that he’s back in the minor leagues. With John Gibson dealing with an injury, the Anaheim Ducks have recalled goaltender Kevin Boyle from the minor leagues to fill in for now. The team is already without Ryan Miller, meaning Chad Johnson will have to hold the crease for the time being. Alan Quine has been sent back to the minor leagues by the Calgary Flames, ending a three week run with the team. Quine has played nine games for the Flames this season, recording four points. He cleared waivers before the season began, and would have had to again if he played another game with the team. A day after going back to the minors, CapFriendly reports that the Colorado Avalanche have recalled Sheldon Dries from the AHL. Dries, 24, has been frequently reassigned back and forth between the Avs and Colorado Eagles this season. The undersized forward has four points in 16 NHL games and only two points in ten AHL games. He’s set to take the place of Colin Wilson who sustained a shoulder injury on Friday night against Chicago and has been placed on IR. In addition, the Avs have brought up winger A.J. Greer and goalie Pavel Francouz, per the AHL’s Transactions Page. Greer has averaged a point per game in 21 contests with the Eagles but is scoreless in four NHL contests. Meanwhile, this will be Francouz’s first NHL recall after signing with Colorado in May. The 28-year-old has fared well in the minors, posting a 2.61 GAA and a .921 SV% in 21 games. The San Jose Sharks sent forward Rourke Chartier back to the AHL’s San Jose Barracuda late yesterday, the team announced. Chartier has spent much of the season up with the Sharks but has been very productive in limited action with the Barracuda. in nine AHL games, the 22-year-old has logged eight points and a +8 rating. However, he has just one lone goal and no assists through 13 NHL games. Chartier has had no problem scoring in the minors so far in his pro career but needs to work on translating that ability to the next level. With Jake McCabe and Lawrence Pilut back to full health, the Buffalo Sabres announced that they have returned defenseman Brendan Guhle to the AHL. Guhle, 21, has been a major asset for the Rochester Americans this season with 13 points in 25 games and has especially stepped up alongside vet Zach Redmond since Pilut took on a full-time role in Buffalo. However, in two brief NHL appearances, Guhle has been a non-factor and still seems in need of seasoning in the minors. The Chicago Blackhawks have flipped forwards, announcing that they have recalled winger Jacob Nilsson from AHL Rockford while assigning center Luke Johnson to the IceHogs. Nilsson signed with Chicago back in May following a decent season in the SHL but he has yet to make much of a mark, collecting just 14 points in 31 minor league games this season. Meanwhile, Johnson has split the season between the Blackhawks and IceHogs. He has been productive in the minors with seven points in ten games but has just a single assist in 15 NHL contests. The Ottawa Senators revealed that have recalled goaltender Marcus Hogberg from AHL Belleville. Craig Anderson took a hard hit on Friday and didn’t finish the game so this appears to be some insurance if he’s unable to dress tonight. Hogberg has been the backup with Belleville this season, posting a 2.55 GAA with a .906 SV% in seven appearances. The Sens had an extra roster spot available so they don’t have to designate this as one of their two allowable 48-hour emergency recalls that would have allowed them to exceed the roster limit. When the Los Angeles Kings activated Ilya Kovalchuk today, the team had to free up a roster spot. The team announced they have placed defenseman Dion Phaneuf on injured reserve, retroactive to Dec. 11, with an upper-body injury that he suffered during the team’s game against the Buffalo Sabres on that date. The veteran defenseman has struggled mightily this season after being a significant addition when the team acquired him in a midseason trade from Ottawa. Phaneuf has just one assist in 32 games this season and averages just 14:58 per game this season, well under his career averages. The Nashville Predators announced that they have returned forward Tyler Gaudet to the Milwaukee Admirals of the AHL. Gaudet was recalled Thursday and was a healthy scratch today against Boston. 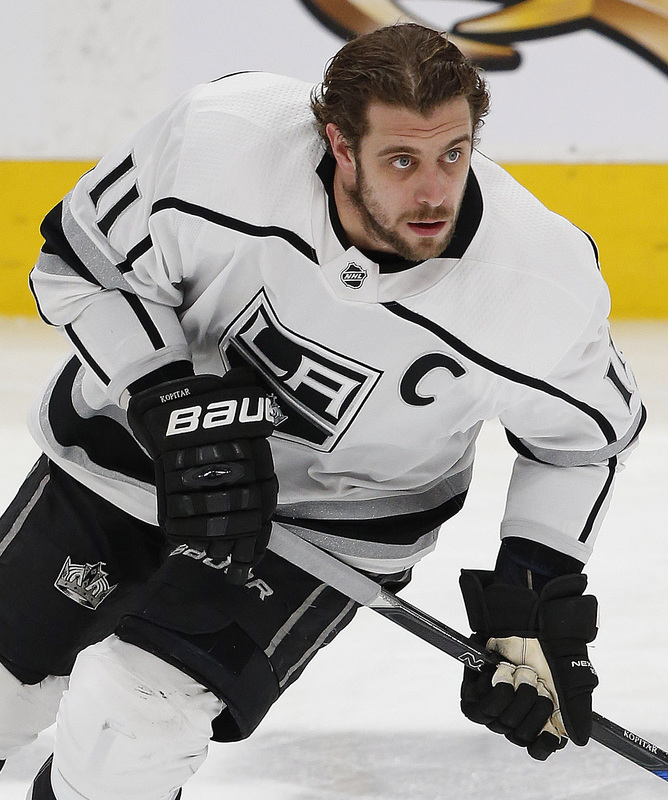 When the Los Angeles Kings begin training camp tomorrow, they will be without three notable players. 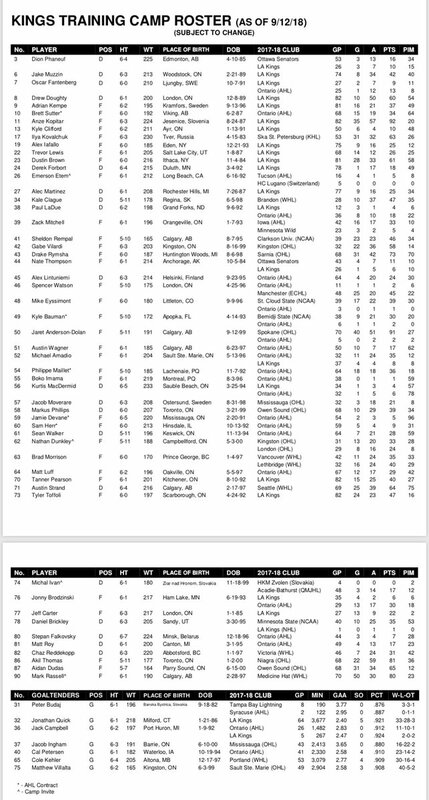 The team announced today that starting defenseman Derek Forbort, top prospect Gabriel Vilardi, and first-year pro Austin Strand will not be full participants when camp opens. Forbort, who is entering his fourth season as a Kings regular, is the least concern. A back injury will keep Forbort from taking part in team drills, but he is well enough to skate and is considered day-to-day. Regardless, Forbort has his top-six role locked in to begin this year and will likely resume playing with Dion Phaneuf after the two found chemistry late last year. The same can’t be said for Vilardi and Strand, who are fighting for roster spots in camp but at this point are considered week-to-week. Vilardi, the eleventh overall pick in the 2017 NHL Draft, is also suffering from a back injury and is completely sidelined for now. The young center could play a major role for L.A. this year, but has to first get on the ice this month and prove he is ready for the NHL. Strand, an undrafted free agent inked by the Kings last season, is hoping to get a shot on the blue line at some point this season. However, the standout from the WHL’s Seattle Thunderbirds must first get over the concussion symptoms that are currently keeping him from practice and game action. 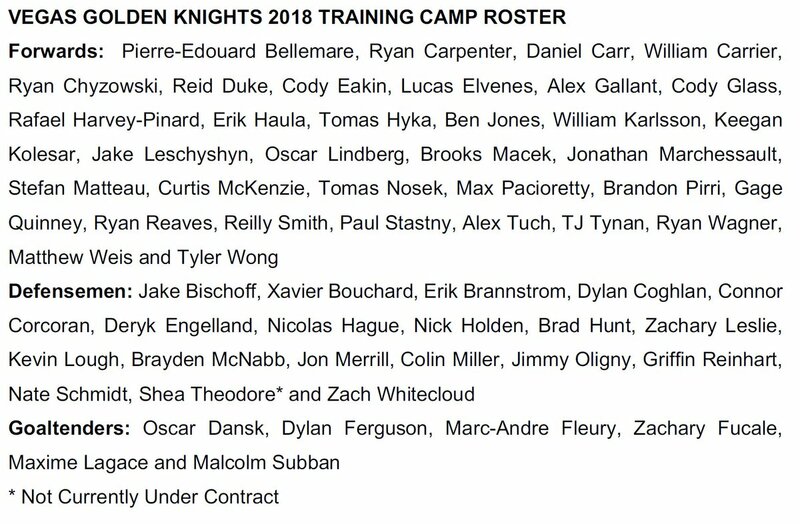 In the meantime, the Kings revealed their camp roster with some extra bodies invited to perhaps make up for these injuries. Junior players Nathan Dunkley, Mark Rassel, and Michal Ivan – one from each of the three CHL leagues – are set to join the team on tryouts. The New York Islanders weren’t willing to give Stephen Gionta a contract extension last summer, but the team ended up re-signing the veteran forward in December. This time around they are still unwilling to give Gionta a guaranteed contract, but they are willing to give him a shot at earning a spot in camp. The Athletic’s Arthur Staple reports that Gionta will join the team on a PTO in camp as he works to play a 13th pro season. Gionta, the younger brother of Brian Gionta, played for the New Jersey Devils organization for parts of eleven seasons, but has suited up for the Islanders and their AHL affiliate, the Bridgeport Sound Tigers, for the past two years. Gionta and the Kings’ junior tryouts are far from the only camp invitees across the league. As teams have announced their camp rosters, many previously unannounced PTO’s have been revealed. The defending champion Washington Capitals have invited Canadian collegiate forward Mark Simpson and WHL goalie Logan Thompson to camp. Their Stanley Cup competitors, the Vegas Golden Knights, will have junior forwards Raphael Harvey-Pinard and Ryan Chyzowski among their participants. The Anaheim Ducks will take a look at QMJHLers Justin Ducharme and Simon Benoit. The Edmonton Oilers add yet another PTO in former Detroit Red Wings prospect forward Luke Esposito. The Nashville Predators have just one additional skater in camp in WHL center Alex Overhardt. The Montreal Canadiens bring in some nearby QMJHL talent with keeper Samuel Harvey and forward Joel Teasdale. The New Jersey Devils will give ECHL goaltender Colton Phinney a shot, as well as junior blue liner Jeremy Groleau. The Detroit Red Wings host six junior players, as well as two of their ECHL affiliate’s players: defensemen Mackenze Stewart and Brenden Kotyk. The Minnesota Wild will also have a large group of tryouts, including twin forwards Drake and Darian Pilon. Finally, the Calgary Flames have invited surprise undrafted OHL defenseman Merrick Rippon to camp, while the Chicago Blackhawks will evaluate his Ottawa 67’s team mate, forward Shaw Boomhower.